Vu Restaurant - located in the Hyatt at Exchange Place, Vu has beautiful views to be thankful for along with your meal. In some unfortunate news, I've received information of two storefronts in Jersey City closing. Congratulations to LITM who celebrated their 10 year anniversary this weekend! Sitting on the corner of 4th and Brunswick with a tree-canopied sidewalk on one side and tables and chairs surrounding, Madame Claude Cafe immediately gives off a corner bistro feel that is only amplified by going inside where the gleaming wood floors and colorful walls and windows will make you forget you're in the middle of Jersey City. Tables are packed closely together and art covers the walls creating an intimate experience. On this particular visit, I went for brunch (although there's never a bad time to go here), and we were lucky enough to arrive before it become crowded (it's rare that it's not). The first order of business was to order a cafe au lait. 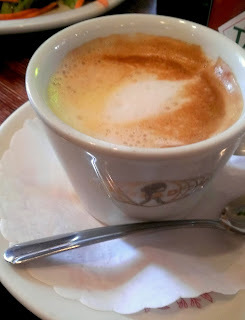 I love Madame Claude's coffee, particularly the cafe au lait; the milk is steamed perfectly to create a slight foam and in combination with the dark coffee, it creates a rich, smooth, intensely satisfying morning coffee that you linger over instead of gulping down. Be careful though - if you order the large, you will get a bowl of coffee and if that's what you're after, fantastic, but otherwise it can be a bit much. Union Republic Opening Saturday Night! Union Republic, located at 340 Third Street, is opening tomorrow night (11/23) and will be open beginning Sunday for breakfast, lunch, and dinner. They call themselves a progressive American Cafe with a focus on Ramen and they support and incorporate the use of local, natural, sustainable, and organic practices whenever possible. The cafe will be serving La Colombe coffee and there will be a specialty grocery area. Pecoraro Bakery, located in what is now officially known as The Village of Jersey City, is a symbol of historical Jersey City. 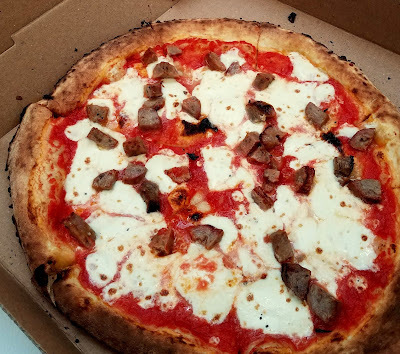 Housed in a building over 100 years old and using an oven that's served generations, Pecoraro Bakery makes just about everything they sell onsite and does so fresh every day. It's often worth walking by just to enjoy the beautiful and often creatively-shaped breads they have in the windows. It's a classic Italian bakery which means instead of finding sweet desserts, you'll find bread. Lots and lots of bread - different types, different shapes, stuffed, plain, etc. and there's really no wrong choice. If you want to choose from the full plethora of options, I'd recommend stopping by early; they often sell out of most of their options by early afternoon, including the extremely popular stuffed breads. As most people hopefully know, Jersey City is a great place to find, drink, and enjoy some really good beer, but tonight, we're going above and beyond our usual excellence. There is going to be so much awesome beer in Jersey City tonight that you should probably just make this Thursday your Friday. Jersey City is considered to be one of the most diverse cities throughout the country. This blend of communities and ethnicities is one of our greatest strengths and in the wake of the destruction caused by Typhoon Haiyan, I wanted to highlight the substantial Filipino community in Jersey City. A couple of months ago, I reviewed Fiesta Grill, a Philippine restaurant close to Journal Square in an area with a large Filipino influence and population. 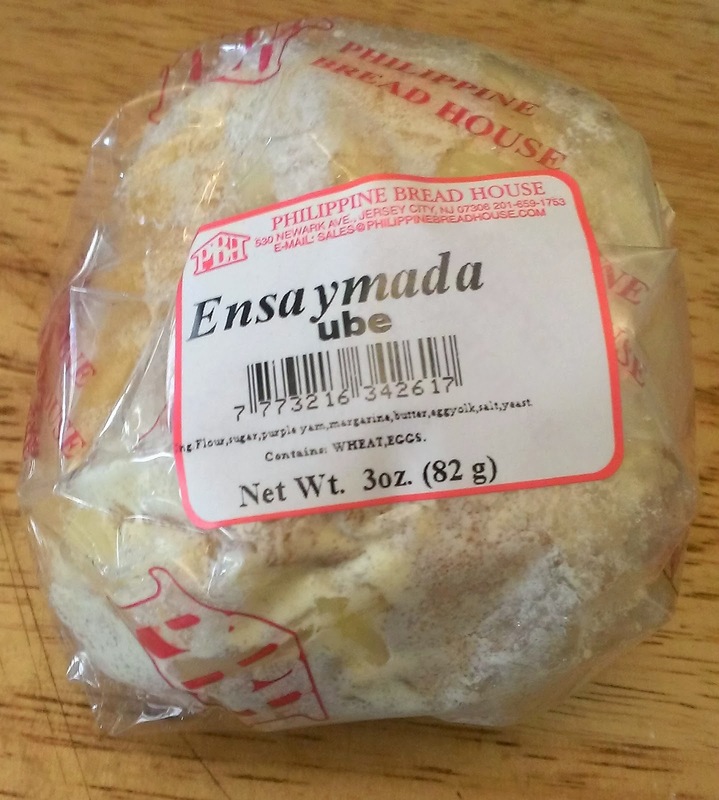 Another extremely well-known spot in the area is Philippine Bread House, a large bakery primarily featuring rows and counters of baked goods to go although there is a small seating area and some hot savory options as well. 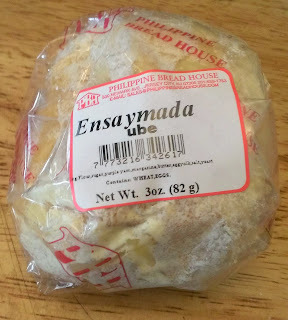 During my visit, I picked up an ensaymada and a mini taisan loaf. 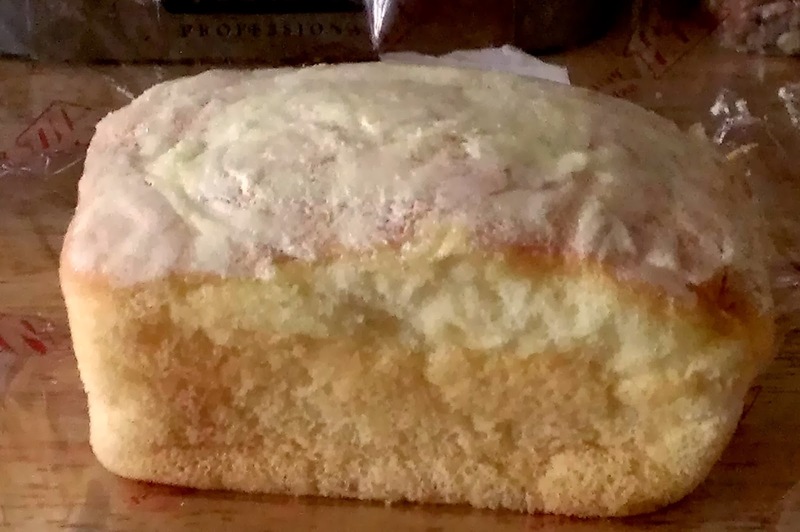 Both are sweetened, yeasty breads as is typical of most Filipino baked goods and sweets. Happy Veterans Day and thank you to all those who have served or are still serving in the military. Your work and sacrifice means a great deal to all of us. If you're one of those people who gets this day as a holiday, then lucky you and I hope you're enjoying it (perhaps with a delicious meal around Jersey City)! Sam A.M. is offering a free small coffee for all vets, as well as serving up military favorite SOS (cream dried beef on potatoes). Congratulations are in order for Jersey City Veggie Burgers who earned enough votes to advance to the finals round in the Start Something NJ challenge - so congratulations and best of luck! Left Bank Burger Bar opened a little less then three weeks ago and every time I've passed by since, it's been full - for good reason. While I don't personally feel we suffer from a shortage of good burger options in Jersey City, it was still cool to hear about a new place opening up with a focus on burgers and promoting its connection to Jersey City - not just through the name, but also through their ingredients including the house veggie burger specially made for them by well-known Jersey City Veggie Burgers and even through the decor. The menu is quite extensive for a burger bar. There's a wide variety of apps, salads, and sides including several varieties of fries (disco is one of them), but of course, the main focus is on the burgers. There's a section with the restaurant's own burger creations, many of which sound fantastic and another section dedicated to building your own burger. Beyond beef, there's the veggie burger as mentioned, turkey, lamb, and grilled chicken breast - so clearly there are some options here. And that's before you get to the long list of toppings, several of which go beyond the expected standards. I'm pretty excited to explore the possibilities of bacon-jalapeno jam and shaved pork belly. I'd had some initial concerns about going when it was so new, but no need. Despite being pretty full, we were seated quickly and the service was very attentive, checking in frequently to see if we needed anything. Our server was very patient and personable as we asked questions (we had many - the menu is fun, but a touch gimmicky and needs some explanation) and made our decisions. She went through the beer list for us (it's a bit hard to see the chalkboard from most of the tables) which was decent and they have a full bar with daily drink specials. 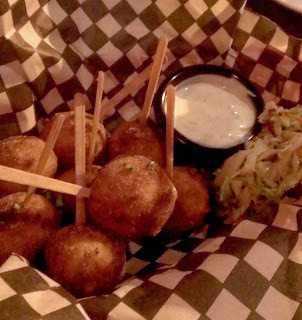 To start, we decided to split the Fried Mac and Cheese pops. There were 8 in the basket, served with a buttermilk ranch dressing. The pops themselves were about the size of a golf ball, not overly cheesy, and held together well. One of mine was lukewarm in the center, but it seemed to be the only one. The buttermilk ranch was creamy, tangy, slightly herby, and an excellent example of what ranch dressing should be. As many of you may have seen, in today's New York Daily News, there's an article proclaiming Jersey City the "next foodie neighborhood"! That's a big deal and it's worth celebrating. It's a great, very complimentary article showcasing a lot of the exciting developments in Jersey City and I am loving all the positive press Jersey City is receiving. The article primarily focuses on the opening of the new Talde restaurant on Erie Street but also mentions several of the other noteworthy spots around Jersey City including some comments by Razza's Fred Shandler and Dan Richer and Thirty Acres' Alex and Kevin Pemoulie about why they felt Jersey City was the right fit for them. It's pretty hard not to notice the IncrediBalls truck - bright orange with a giant logo screaming BALLS, they make their presence known. But trust me, it's a truck you want to know. The IncrediBalls truck has been parking in various locations around Jersey City for a little over five months and in that time, they've developed a devoted following. Not only do they offer a regular menu of meatballs, but they also offer up specials with such frequency you wonder at their creativity. Some, I'm sure, are less successful than others, but all interesting ideas. The people behind the truck seem to have a great sense of humor and of fun, even offering up free candy at lunch on Wednesdays for hump day. I've been there a couple of times, and each time, they've gone out of their way to engage their customers, talk about the food, and be helpful which is much appreciated. I recently stopped by when they were parked outside of Cocoa Bakery - the two have been joining forces and are discussing the possibility of a combo special, most likely available at the truck - and after some deliberation, I decided to go for the bowl of four meatballs. You can get all the same or mix and match two different kinds. They also allow a mix as an option for full sandwiches which is nice if you're like me and can't make up your mind. 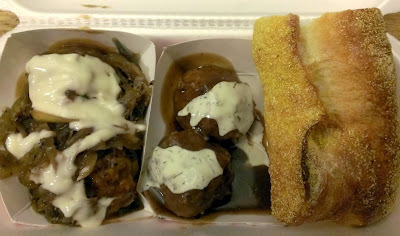 I chose one of the Fan Favorite specials - Southern Smothered Pork and the Norwegian off the regular menu. As you can see, they helpfully separated the two kinds into two boxes. Details matter. So this Tuesday in Jersey City is turning out to be pretty great! Not only are you able to exercise your constitutional right and vote(!) which in turn led to no alt.side of the street parking today(! ), there's been several exciting announcements that I definitely think everyone should take advantage of. Cocoa Bakery is offering a Two for Tuesday BOGO on cupcakes from 4-6pm today so make sure you stop by and take advantage of this great deal for some delicious cupcakes! Sam a.m. Cafe will be open until 8:30pm tonight in case you need a little caffeine buzz to get you through your voting decision-making process. Labels: Cocoa Bakery, coffee, events, food tours, modcup, news, sam a.m.
Incrediballs has been hard at work on a special Thanksgiving meatball and they are hoping to debut it this week! Additionally, they will also begin carrying a vegetarian chili which is welcome as we head towards the cold weather. In other Incrediballs news, Cocoa Bakery and the truck are continuing to enjoy their partnership and they're hoping to arrange some sort of combo or other deal where Cocoa Bakery's cake truffles will be available at the truck so stay tuned for more information on that. Keep the Halloween Party Spirit Going! Jersey City is not letting Halloween fade after just one night! There's lots more fun and celebration to be had this weekend so don't put away your costumes yet! Tonight, 9th and Coles is having their 4th Annual Halloween and Costume Party where they are eager to crown a winner with a grand prize of a $100 bar tab!